On an integrally carved naturalistic base; the reverse hollowed out. 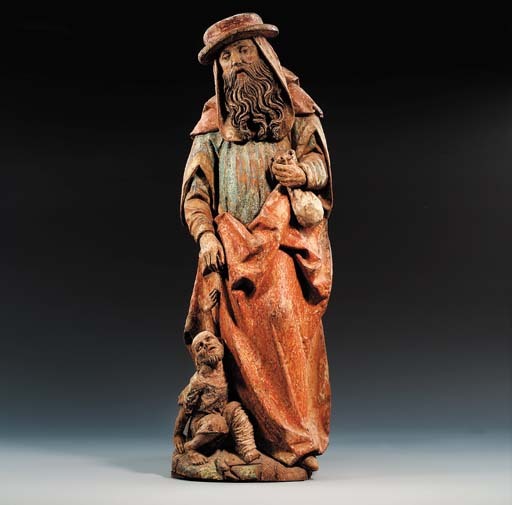 Saint Homobonus, the 'good man', is depicted with his usual attribute, the beggar to whom he is giving alms. He was a merchant of Cremona (d. 1179), and used his considerable wealth to aid the poor in the town. A legend says that while travelling, he gave all his food and drink to a beggar and as he refilled his flask from a stream, the water miraculously turned into wine. Although married and without having taken Holy Orders, he was canonized a few years after his death due to popular demand from his fellow citizens.